I've been trying to chip away at these tank models when I get a chance. 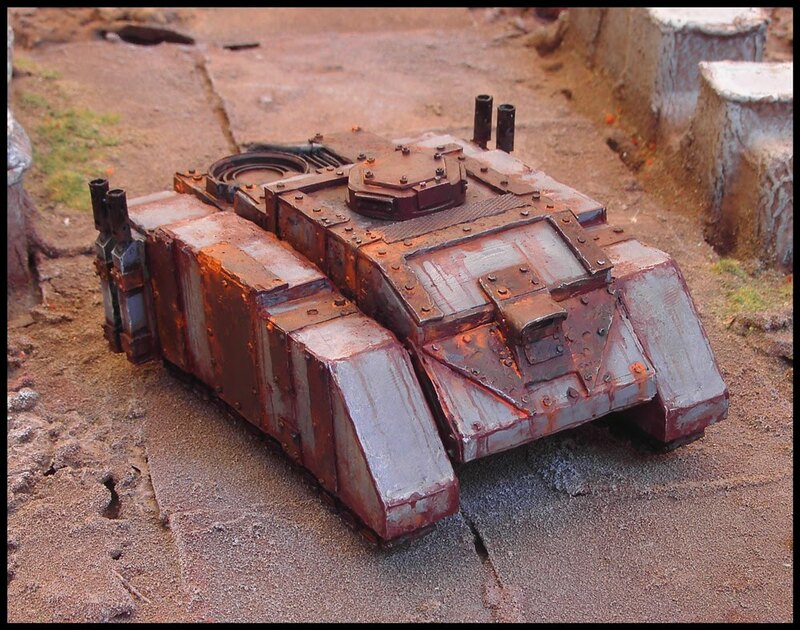 Despite their plain appearance, these tanks (the 'Iron Grumbler' from Ramshackle miniatures), have had HOURS of work put into them already, and are nowhere near finished. The material is a pain to work with; a dangerous combination of heavy and fragile and the pieces don't fit together properly. Cue hours of chipping away at resin and farting around with milliput to fill the gaps. After trying to figure out a way to represent a combi-bolter I opted for just sticking the kit's exhausts onto the roof, facing forward. With the addition of a few bits and pieces the tanks are starting to look more the part. 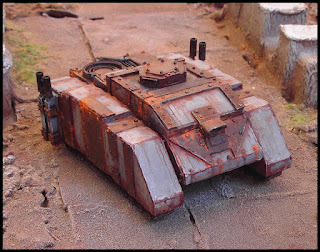 I have kept one 'naked' tank aside for a future project (possibly a vindicator). 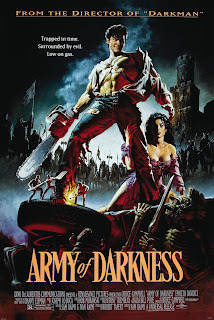 The next time I picked up the model the bleedin' 'guns' had snapped off at the ends. I suspected this might happen the moment I stuck them on. Now they're supported with cut out squares from the sticky end of a post-it note pack (easy to adjust). So, bricks. I added some sand to the bases, loading up lots of sand and pva glue over the worst of the model's faults. A delightful chap at the club gave me an unwanted chaos predator too, so it was de-iconed and received the same treatment. I began with Fortress Grey and Chestnut ink in the recesses. Except for a hastily painted Ork truck many years ago, I've never painted vehicles, and now I'm a bit unsure of where to go next. The club have some excellent urban boards, and am leaning toward these vehicles being repurposed military or policing personnel carriers of some kind. 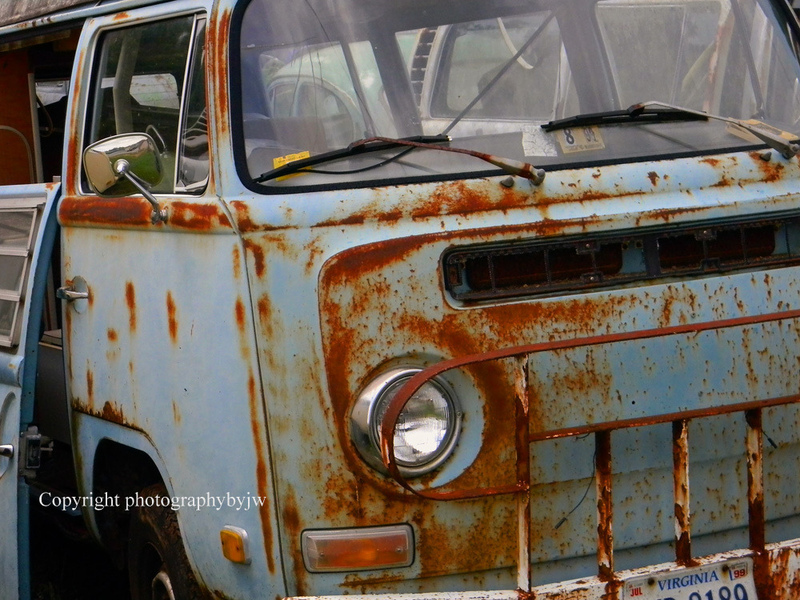 Jury rigged, poorly maintained, noisy, ugly, smelly. 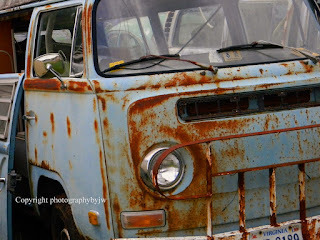 I'm going to start looking for tutorials for painting weathered vehicles. Valkia the bloody, Scyla, and Doktor Festus. Labels: Chaos Warriors, Leaked pictures, Warhammer, warhammer. I've been chopping up models again. 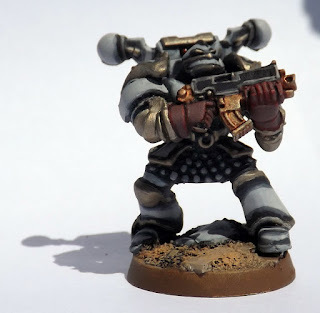 It's common knowledge that the Dark Vengeance cultists contain a lot of duplicates, which is sad for a troop type that is supposed to be so numerous. I remembered all the sets of 3 models you can get where, upon closer inspection, you see that they've just used the same model but swapped a head or limb for variety, so I did the same. I also converted all of the pistol and ccw cultists to wielding autoguns. 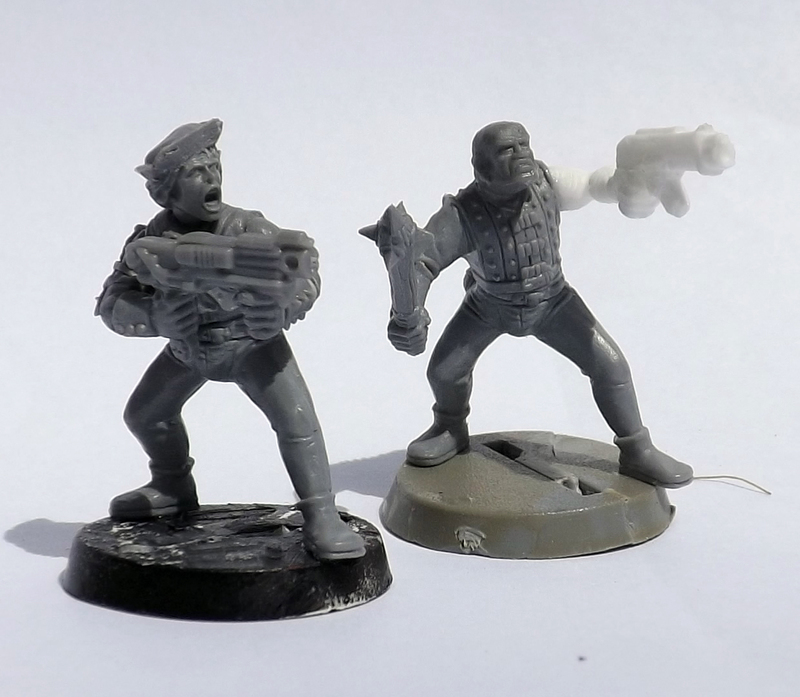 The heavy gunner on the left has a head from a DV terminator's base, and his arms are from Mantic's orx. It'll probably be another flamer. The Iron Grumblers arrived from Ramshackle a few weeks after ordering. They take some time to arrive because the company doesn't hold stock, instead casting as orders come in. Price; the 3 tanks came to £27 including postage. 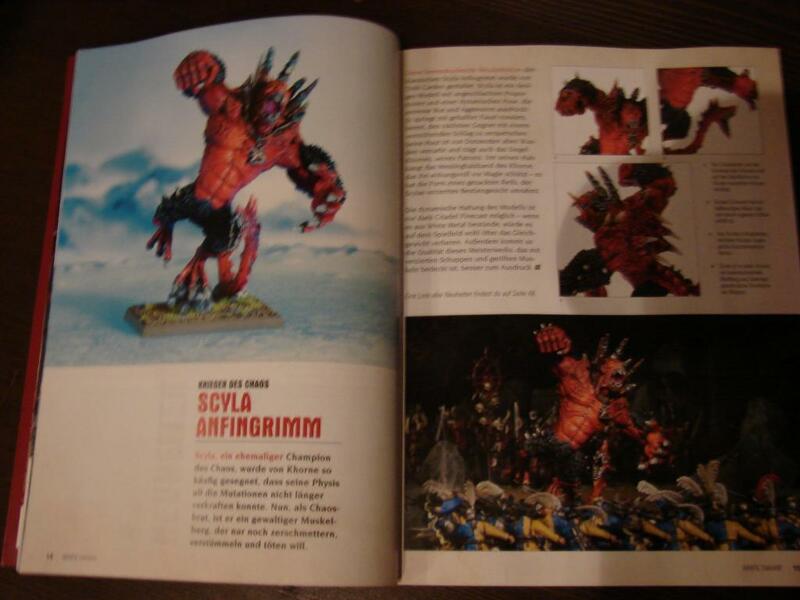 This compares well to the GW equivalent, with unpainted Rhinos going on ebay for about £15 -£20. Size; to Space Marine Rhino; about half an inch longer and taller, so no complaints from opponents. Modular; I like that all the bits come separate, so there is some room for customisation and adjusting the height of the central parts. Material: Resin, haven't used it before, probably won't buy anything so large in resin again. It's heavy, but feels fragile; if this gets dropped it's going to shatter like peanut brittle. The little protruding exhaust pipes might not survive much transportation. Casting errors: The tank tread detail is significantly obscured by faults. All I could do with them was chip away the biggest lumps and think about hiding all the gouged out holes with mud or something. 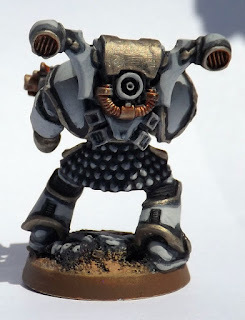 Bits; no bits, unlike GW kits. How much of an issue this is depends on your own access to bits. The difference in price helps me see past the models' faults, and I'm looking forward to filling them with cultists and marines. Mixed feelings with these ones. 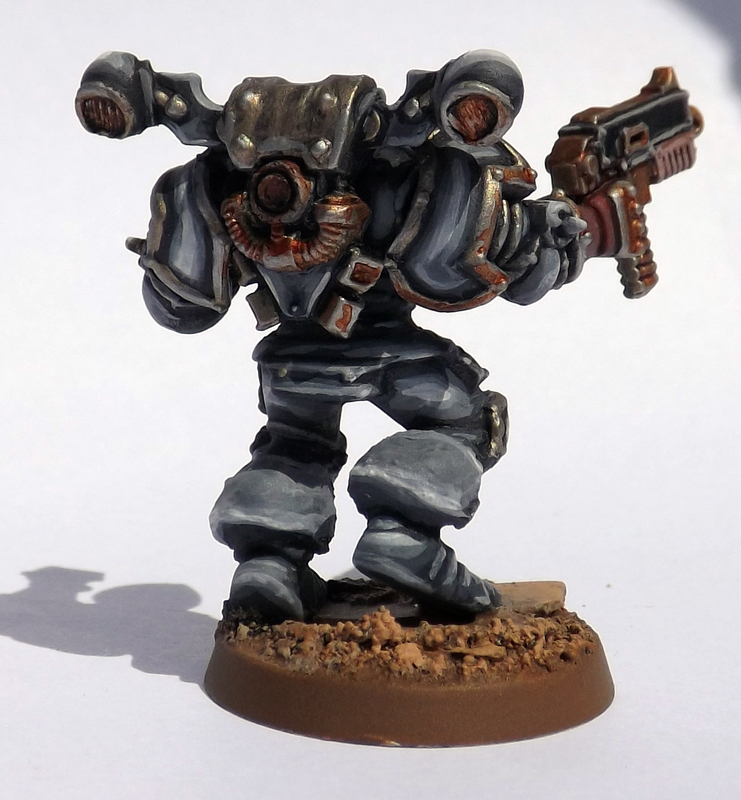 After spending hours converting and painting the mercenaries, the Games Workshop Purity Seal varnish has done a horrible frosting effect on the models, obscuring some of the detail. If anyone can recommend a fix I’d love to hear it. Anyway, here they are, at least they’re done. In anticipation of the new Chaos Cultists due to be released with the 6th edition starter set, I have been scratch building some pirate types to accompany the Space Marines. I don’t have a clear vision for fluffing the force, so I’m concentrating on making the models as versatile as possible. 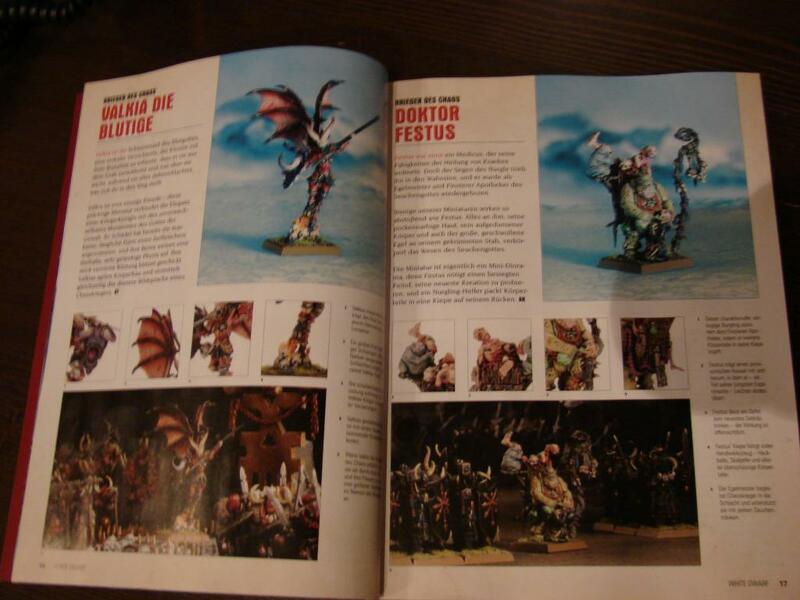 So these ‘cultists’ don’t have imperial markings, but also aren’t slavering chaos-star waving fanatics either. 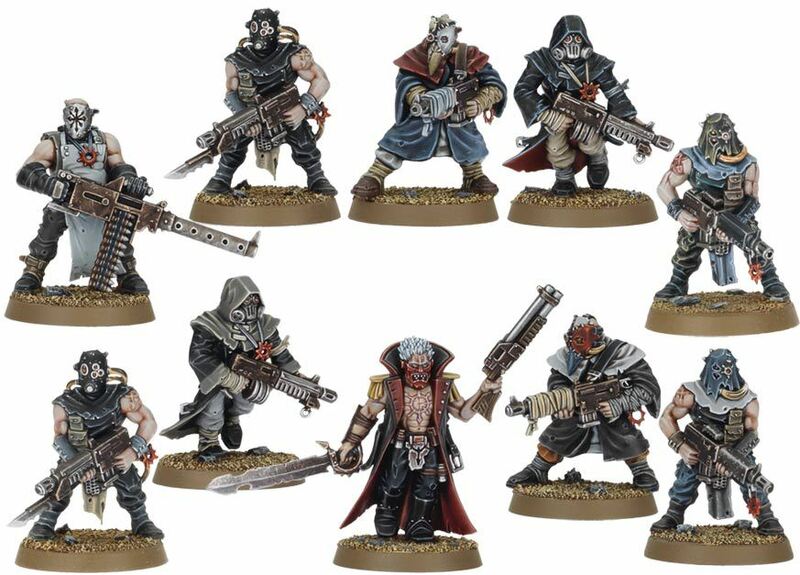 I imagine them to be ganger scum, or opportunists under the employ of a rogue trader. They could fit a number of roles because of the deliberate lack of markings. They are a combination of Warhammer fantasy empire militia, catachans, and some mantic orc bits and fantasy chaos warriors. There’s also a couple of Toy Story soldier heads. I have concentrated on trying to build them with believable poses, making sure the face and the leading foot are pointing in the same direction. 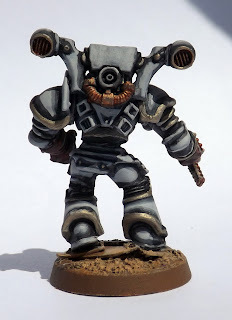 In the past I’ve been quite slapdash when putting models together, and ended up looking like mental disco dancers. I've had to have a bit of a guess at their equipment. I don't think lasguns counting as autoguns is much of a stretch, and those wielding hand weapons and pistols will probably join the rest of the lasgunners, as I've heard assault is quite weak in 6th ed (not that I've played enough 40k to make any real judgment). I've also put together a heavy bolter for the marines squad, which I will increase to 10 models so as to warrant a rhino. Ramshackle's 'Iron Grumbler' is of comparable size to Games Workshop's rhino, so I have ordered 3. They take a little while to process orders as everything is done by one man, but I am looking forward to getting my hands on them as I think they'd suit the slightly weird looking marines. 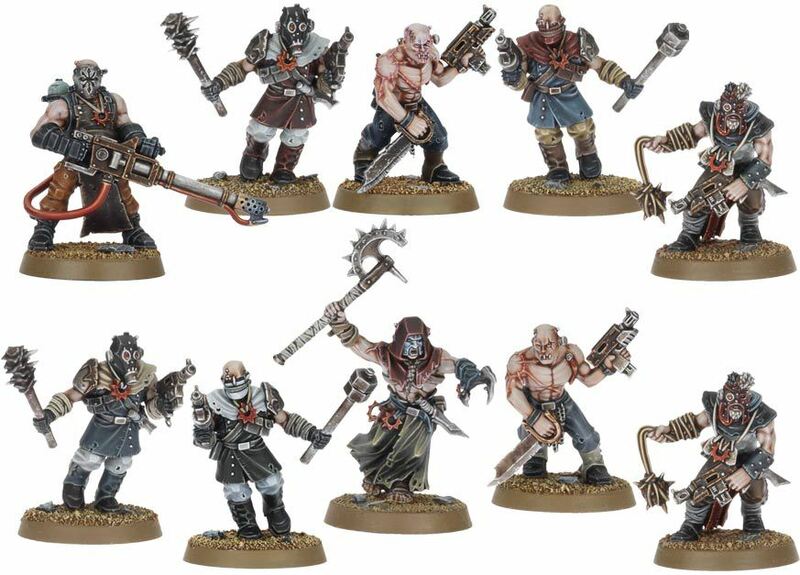 A unit of 5 techno-barbarians, painted without faction markings so they can be used as either chaos marines or loyalists. 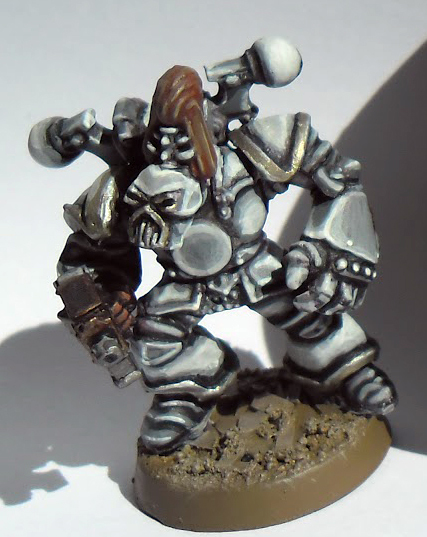 Techno-barbarians is the name given to the warriors who battled over the ruins of Terra during the Age of Strife. 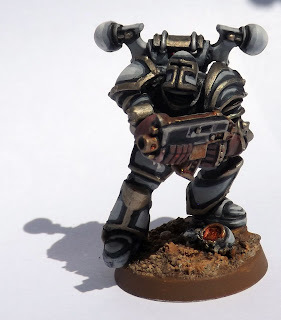 They formed the troops of the warlords who dominated Terra during the period, and were equipped with a primitive form of powered armor which would become the basis for the developments of Space Marine armor. The Emperor arose in the later part of the Age of Strife to reunify Terra. Under his leadership his army conquered the other warring techno-barbarian factions. This early armour was produced on a completely local basis and as such individual suits varied heavily and their exact designs were often a matter of personal taste. 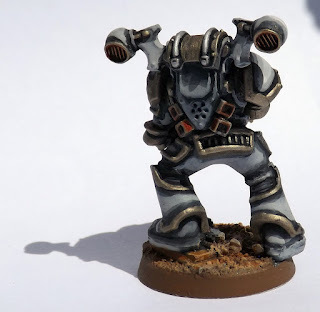 All backpacks are from the Chaos marine spru, to make them look as old fashioned as possible. I have been meaning to see how the chaos marine and old chaos warrior plastic kits fit together for some time now, and I found the proportions to be similar. With the leader and the marine below I attempted to sculpt the legs myself with milliput, but in the end I just opted for the easier way; cutting the marine and warrior legs at the calf and sticking them together. The biggest issue with fitting the kits together was cutting and repositioning the arms. 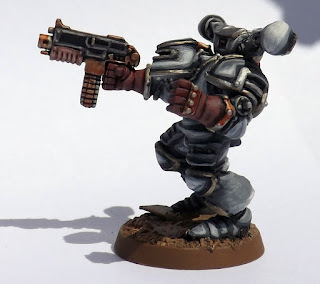 Most fantasy figures have outstretched arms for brandishing hand weapons, whereas a lot of 40k ones require arms that 'hug' a gun closer to the body. After this miniature came out a little short looking I tried bulking out the joins with plasticard to add height and width. 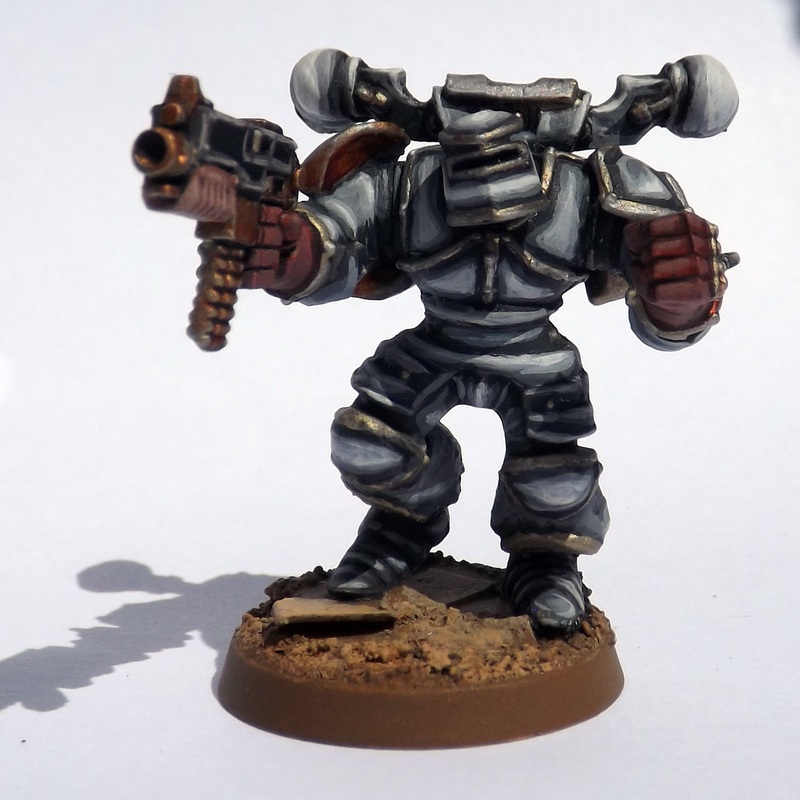 Finally, here's a shot of a couple of WIP cultists / renegade guard, in anticipation of the new unit for Chaos in 40k. 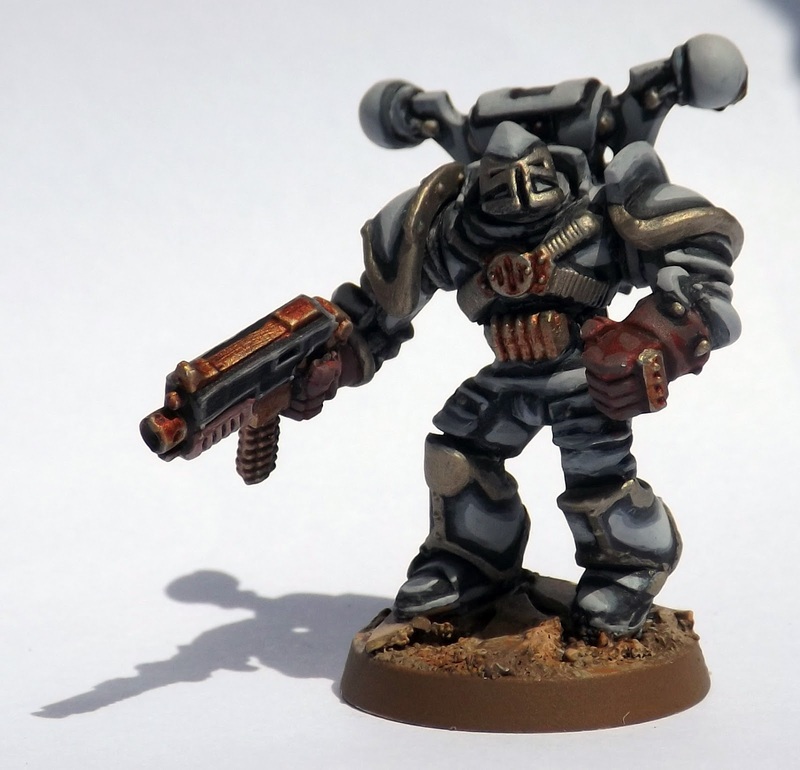 They're mostly fantasy empire militia, but I'll be hunting for any scraps to make them suit the 40k universe.